Does the processing framework no longer accept inputs in this way? Seems that the processing script approach is quite different in the QGIS 3.0 than in the QGIS 2.x versions. At least, at the moment the old script syntax has given way to the Pythonic way to implement processing algorithms. creates a new identical one. is not need for additional work. # calling from the QGIS console. # dictionary returned by the processAlgorithm function. 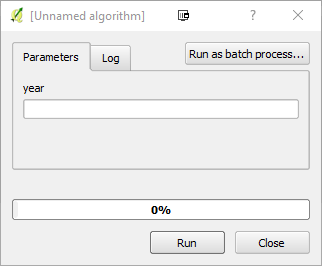 Please, take a look into this blog post by Anita Graser for more detailed information on how to create a processing script in QGIS 3: Processing script template for QGIS3. Also, there is a GitHub pull request #6678 load default script from template by Matteo Ghetta to ease the processing algorithm script creation in QGIS.